BRISTOL, Tenn. – Brad Keselowski said last week that Hendrick Motorsports might be fudging on the rules directed at rear ends and suspensions to gain a competitive advantage. He backed off those comments somewhat Thursday evening during a media function at Bristol Motor Speedway. 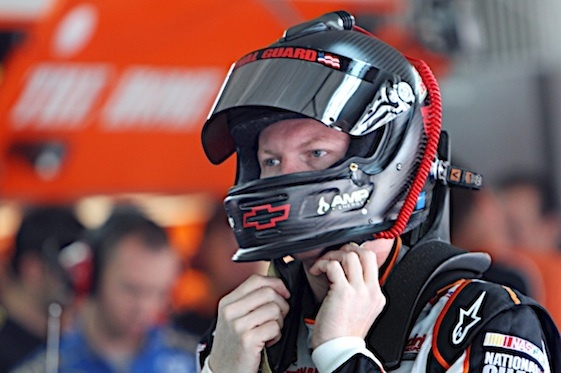 Dale Earnhardt Jr. was asked on Friday if Keselowski, who used to drive for Earnhardt’s JR motorsports in the Nationwide Series, was playing mind games with the Hendrick camp. “No, not really,” Earnhardt said. “I do know Brad pretty well. Brad is a really good guy. He has a pretty good heart. During the early days of his career, five-time Sprint Cup champion Jimmie Johnson struggled mightily at Bristol Motor Speedway. But that all changed four years ago when he adopted a new methodology for maneuvering the .533-mile oval. “There really has been a change and it’s been with me and the way I drive the car,” said Johnson, who has six top 10 finishes including a victory in his last seven Bristol starts. “For the longest time, I was driving the track incorrectly and then we would build a set-up to support my driving style here. I’d get into the race and things wouldn’t work. So it’s a tough challenge for a driver. It doesn’t matter how long you’ve been in the sport or what you’ve accomplished, there are tracks that challenge each team and driver differently than others. Most Sprint Cup drivers were reluctant to offer an opinion on the type of racing the revamped surface at Bristol will produce during Saturday night’s IRWIN Tools Night Race. But Kyle Busch didn’t mince words following the first Cup practice when asked about track conditions. Well JuneBug, last I looked I’m pretty sue Brad’s been in the 10-race D0-Over Farce as many times you since 2008. And OH YEA, has easily won more than twice as races as you since 2008. BTW JR., Denny Hamlin who started Cup in late 2005, will easily pass you next year on the all time Cup win list. With 1 only legal win since 2006, easy to see why.